Having a glass of wine or two can be an enjoyable way to socialize and relax, but there can be unforeseen risks to drinking while you travel. Consuming alcohol can increase your exposure to health risks, but it can also disqualify your claim to travel health insurance coverage. Travellers often learn too late that alcohol-related accidents or illnesses are not covered by their insurance policy. Knowing the limitations of your insurance and making smart choices can help you stay safe during your trip. Many travel health insurance policies include an alcohol exclusion clause. However, the clarity of the clause will depend on the insurer and the specific policy. Some policies define the exact blood alcohol level that will exclude you from coverage (e.g. in excess of 80 milligrams of alcohol per 100 millilitres of blood), while others will use vague terminology such as “misuse”, “excessive use”, or alcohol use that “affects judgement”. Your insurer will have grounds to deny coverage for any related medical expenses if your accident or illness is deemed to be alcohol-related according to the terms of their policy. Your claim may also be denied even if the accident or injury is not directly related to alcohol consumption but could be considered a contributing factor (i.e. at the time of your medical emergency, you are found to have used alcohol in a way that disqualifies you from your coverage). All too often, travellers find themselves in financial difficulty when they suddenly become responsible for the full cost of medical expenses owed abroad. To avoid this, always read your insurance policy carefully to ensure that you understand the limitations of your policy and the types of “high-risk” activities (e.g. alcohol use) that can exclude you from coverage. If the terms and conditions of your policy are vague, ask your insurer for clarification. For more information see our Guide to Travel Health Insurance. Drinking too much alcohol, either on occasion or over time, can have long-term effects on your health. Alcohol consumption impairs liver function, damages the heart, causes pancreatic inflammation, and increases the risk of developing certain cancers. Alcohol also affects the function of our brain, resulting in physiological effects such as changes in behaviour, memory loss, confusion, poor coordination, and loss of inhibitions. Increases in risk-taking behaviour resulting from alcohol consumption can lead to unsafe food choices, violence, and risky sexual activities. Consuming alcohol while you travel can also increase your exposure to certain associated health risks. For example, mixed alcoholic beverages can contain juice, ice, or water that may be contaminated with bacteria, viruses or protozoa. This can lead to gastrointestinal illnesses such as travellers’ diarrhea or hepatitis A. Staying within these guidelines can help you reduce the short and long-term health risks associated with alcohol use. However, if you are managing a pre-existing condition or are taking certain medication, you may need to drink less or not at all. Women who are pregnant or planning to become pregnant should not drink. Take the time to read and compare travel health insurance policies before purchasing. Make sure you understand the limitations and exclusions involved in your policy related to alcohol use. Make sure that you are familiar with any potential interactions between alcohol and prescription or over-the-counter medication you are taking. Consult a pharmacist if you have any questions. Always stay within the suggested daily/weekly limits for alcohol consumption and make sure to have a few non-drinking days within the week. 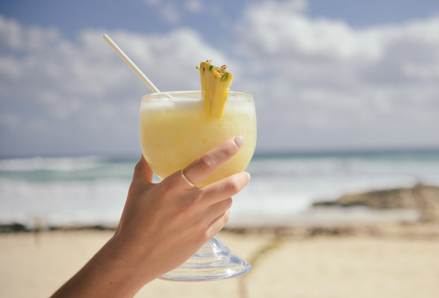 Practice caution at all-inclusive resorts, cruises, or events with unlimited access to alcohol. For every alcoholic beverage you drink, have a non-alcoholic beverage, preferably water. Avoid exceeding more than 2 drinks in a 3-hour period. Alcohol is a diuretic (it promotes fluid loss) and can cause you to become dehydrated. Certain factors such as a being in a hot climate, exercising, or taking high blood pressure medications can also increase your risk of dehydration. Always drink water consistently throughout the day and when consuming alcohol. Be cautious of different types of alcohol at your destination as certain kinds may be stronger than what you are used to. Consider the source of your alcohol. Avoid home-brewed products and ensure that new bottles are either opened by you or opened in front of you. Eat first before drinking and ensure that you always follow precautions with your food and water to prevent gastrointestinal illnesses. Always take precautions such as never leaving your drink unattended, never accepting a drink from a stranger, and always watching your drink while it is being prepared. Trust your instincts and look after your wellbeing. If you feel pressured to drink or feel unsafe in a certain situation, find a person you trust and make plans to leave. Do not operate a vehicle (including mopeds or motorcycles) after drinking or get into a vehicle with a person who has been drinking. Before you go out for the night, look up local transportation routes and contact information for taxi services in your area. Be cautious of the legal implications of alcohol use at your destination. Ensure you abide by the local minimum age restrictions and avoid actions that could lead to arrest such as public disruption and illegal drug use. Consider how alcohol consumption is perceived in your destination country. Do not drink alcohol in countries or regions where it is prohibited. Your travel health insurance exists to help you in the event of an unforeseen medical emergency, but participating in activities that are considered to increase your risk for personal harm (e.g. alcohol use) puts your coverage at risk. Knowing the limitations of your policy and how to drink responsibly can help you stay safe and healthy while you travel. Photo by Ed Gregory, Stokpic.